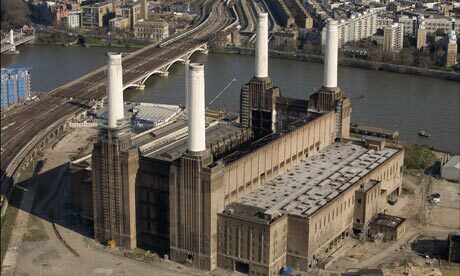 Chelsea have appointed one of London's leading developers to explore the feasibility of building a new stadium at Battersea Power Station. The club, who still need to buy back the freehold of Stamford Bridge before they can move anywhere, are acting in order to ensure they would not miss out should the location emerge as their most viable option were they to choose to relocate from their current home. The Blues have appointed Mike Hussey, chief executive of Almacantar, as their development partner and have hired architecture firm Kohn Pedersen Fox to draw up plans for the construction of a 55,000-60,000-seater stadium to the south-east of the Grade II listed power station site. A Chelsea spokesman said: "In the past, we've talked to various people with interests in Battersea Power Station, but we haven't had any substantive discussions with anyone regarding that site for several months. However, in light of current developments, we now think it prudent to look again at the feasibility and potential for the BPS site to be developed for a football stadium. We have made no decision to leave Stamford Bridge, and we continue to discuss with the local council any economically viable options to expand the the Bridge, but we will continue to investigate various options close to Stamford Bridge." Chelsea have still not given up hope of persuading the owners of Earls Court to give them permission to build there but the prospects of doing so are fading by the day. There would also be complications involved in moving to Battersea Power Station, which has been empty for nearly two decades. Its owner Real Estate Opportunities, largely owned in turn by Treasury Holdings of Ireland, has been trying for a year to find an equity investor to fund a proposed £5.5billion redevelopment. The site reportedly owes Lloyds Banking Group and the Irish National Asset Management Agency around £300m, a debt which can be called in at any time. A Malaysian investor, SP Setia, has offered to buy the senior debt for £255m at 85p in the pound, according to reports.That is the least of Chelsea's concerns for now as they try to formulate a proposal to persuade Chelsea Pitch Owners to sell them the Stamford Bridge freehold after the supporter-led company rejected last month's offer. The club cannot move unless they are able to sell the land beneath their current home.